Have two different practitioners, have either which one have their own colored dental folder. Have different types of patients, allow the different types to be colored for their unique needs. Give your filing system a little bit of color to match your office. Take your dental filing system to the next level by using Allied System Products best in class AAK Filing method using all 10 colors, eliminating misfiles and speeding up filing by 80%. The blending of our dental chart and dental filing system makes a match that will last and last. Here at Allied Systems Products we try to go beyond just a plain old folder or filing system. We try to make a dental chart that fits your needs and a folder and system that can stand the test of time and evolve with you. Our dental pocket charts can be modified quickly to have multiple divided sections, multiple fasteners, other pockets or other filing accessories attached. Stop having your over worked staff assemble patient folder after patient folder just to fall behind with other items. Have the dental charts to come assembled just the way you like it. With our in house fastener machine we can put dental chart fasteners in any position in the folder. 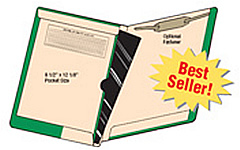 Our best in class dental folders are full end tab folders. All the handling sides of our dental charts are reinforced to stand the test of time. Tick marks are on the end tabs allows for easy and consistent labeling. And all folders are also scored for ¾” expansion, and a sections for personal information and a visual indictor of year the patient started coming into your office. Our dental files can evolve with you. Need more or less dividing pages, need the fastener in a different position, don’t need a built in pocket in your chart? All those items and a lot more can happen with our best in the dental industry dental filing charts. Stop having your $15+ and hour office staff assemble your folders. Allied assemble staff can assemble you dental folder your way for ½ the overall price. Need a place to put paper quickly into your folder? Our F2640 and F2643 are both dental pocket folders. The F2640 built in pocket is a little larger than the F2643 because it uses the end tab of the folder on expand the built-in pocket. The pockets are inward facing to keep the paper work secure inside. Still have parametric X-rays? The F2640 dental folder securely holds full size Panoramic X-Rays in its built in pocket with no trimming needed. Allied offers four lines of colored bordered dental charts. Designed to store panoramic sized X-rays or a full sheet of paper. The convenient left sided 8-1/2 x 12-1/8” built-in pocket securely holds X-rays and documents in place without causing damage to the documents by writing directly on top of them. Available in 10 distinctive colors. 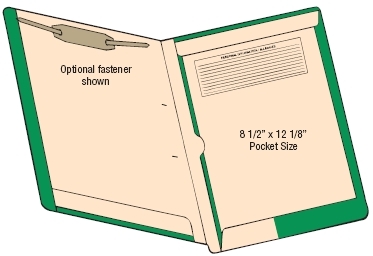 Easy custom folder options - Place the fastener where you want. Add divider pages or labels. Done the way you want it by our custom installation team. Our most popular folder setups can be found here. The original AAK color banded folder. 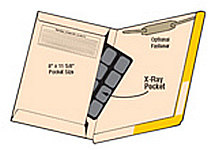 Has an easily accessible right sided 8 x 11-5/8” built-in pocket that securely holds X-rays and documents in place. 22pt reinforced edges to provide extra protection from daily wear & tear. 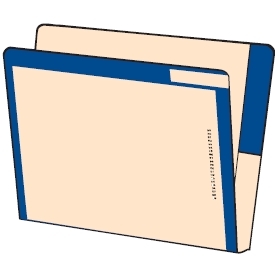 2633 Color banded folder for use with color coded filing systems, eliminating misfiles at a glance. Available in 10 distinctive colors. Reinforced double ply end and top tab. Can be used with top tab filing also. Designed to store panoramic sized X-rays and documents in a right sided 8-1/2 x 12-1/8” built-in pocket.